How Were Cell Type-Specific Avalanche™ Transfection Reagents Developed? New mini16 thermal cycler is finally here. Update your Cambio preferences for newsletters and more... today! Broad range transfection reagents suitable for transfecting a broad range of different cell types, including mammalian and insect cells. Transfect DNA, siRNA, mRNA, and protein with these tried and tested reagents. In cell biology, transfection is the term given to the introduction of foreign genetic material into eukaryotic cells. In addition, a distinction is made between temporary introduction into the host cell (transient transfection) and permanent integration into the genome (stable transfection). The process of transfection basically corresponds to that of bacterial transformation, albeit under a different name. 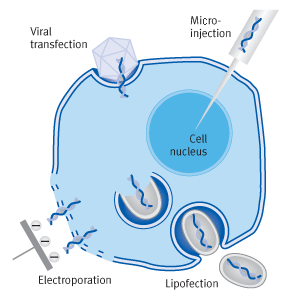 Viral transfection uses genetically modified viruses which are no longer pathogenic and carry the gene to be introduced. In this method problems include the frequently non-directional stable integration of the gene into the genome of the host cell, the laborintensive production of the viruses and the strong immunological response. Physical methods such as electroporation or microinjection are cost-intensive and of limited use in routine procedures. Chemical methods include calcium phosphate precipitation, transfection using cationic polymers and - among the most efficient methods – lipofection, using cationic lipids. 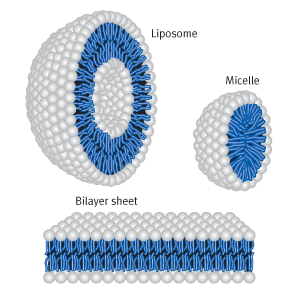 In aqueous solutions, cationic lipids form vesicles with a bilayer lipid sheet, known as liposomes. When liposomes encounter nucleic acids they re-form into nucleic acid lipid complexes called lipoplexes which can be actively taken up by eukaryotic cells by means of endocytosis. In this case, the lipoplex enters into the cell cytosol via the endosomes. The endosomal structure is destroyed by increasing the osmotic pressure created by the lipids' buffering action within the endosomes and by the fusion of the lipid with the endosomal membrane. The ability of a lipid to destroy endosomes is one of the main characteristics of an efficient transfection reagent. DNA which is introduced into the cell cytosol cannot penetrate the membrane of the cell nucleus ("nuclear barrier"). Access to the nucleus is thus only possible if the nuclear membrane dissolves during mitosis. For this reason, the cell division rate is critical in DNA transfection and must be as high as possible for efficient transfection. For transfection of RNA their is no "nuclear barrier" as it is not neccessary for RNA to enter the nucleus for unfolding their biological effects. As a consequence the rate of cell division doesn't play a role. Transfection is a complex process in which the lipoplex amount and proportion of genetic material in relation to transfection reagent, i.e.lipoplex composition must be precisely optimized for each cell type. Transfection reagents and methods show different profiles of performance in dependance of kind of nucleic acid and cell type used. Without reference, it is not possible to predict the suitability of a reagent or method concerning a special application and has to be determined empirically.